Smart monitoring platform for gathering actionable insights from big data. Vkontakte, blogs, forums, comments, review sites, sharing sites, bookmarking sites and more! 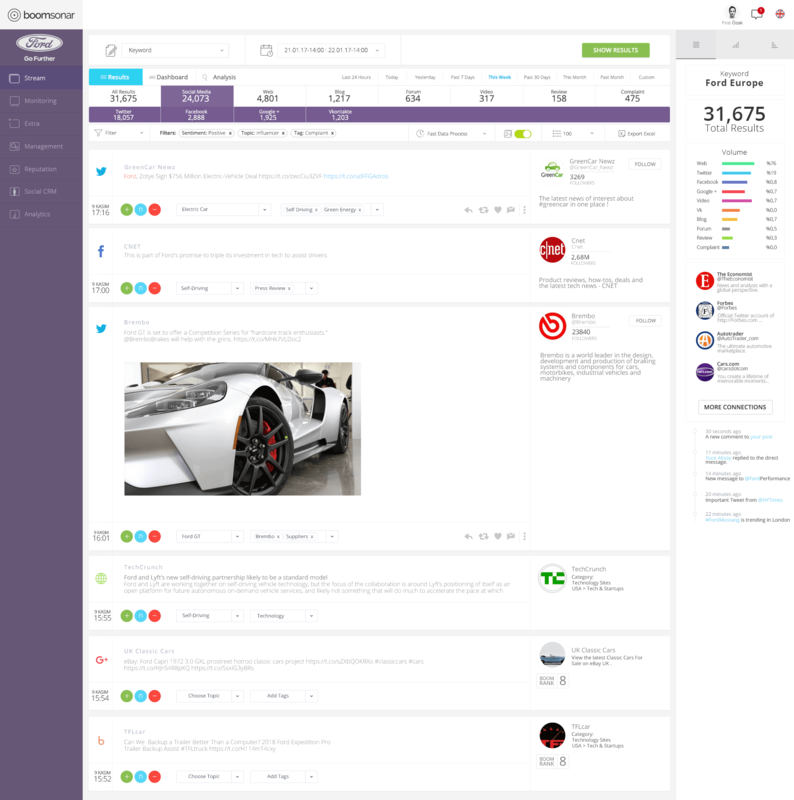 Monitor and analyze websites, news sites, portals, blogs, forums and more! Download your results to Microsoft Excel, get stunning reports in PowerPoint! BoomMonitoring is designed to provide real-time monitoring of the online conversation. 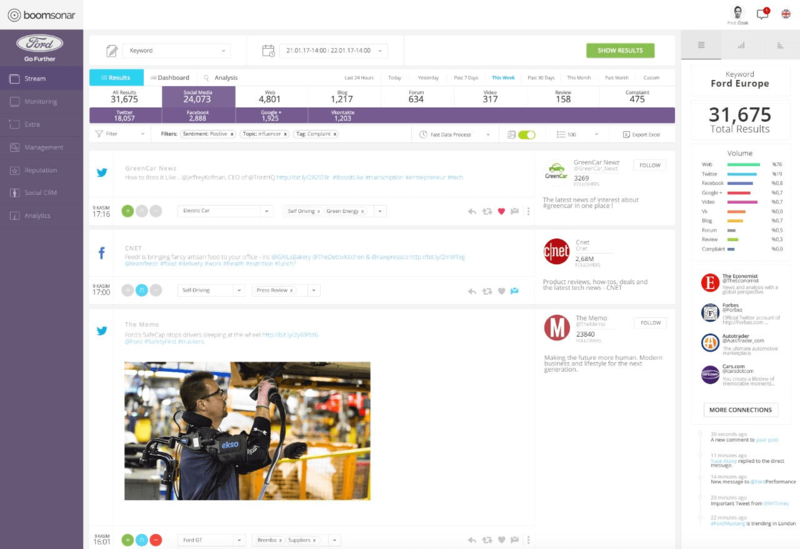 Get insights for your company, organization, or leaders on the web and social media. Be informed about every topic, from customer relations to corporate communications. Find All Results, Analyze, Take Action And Report! Analyze the news articles, read blogs. Monitor every result in real time! 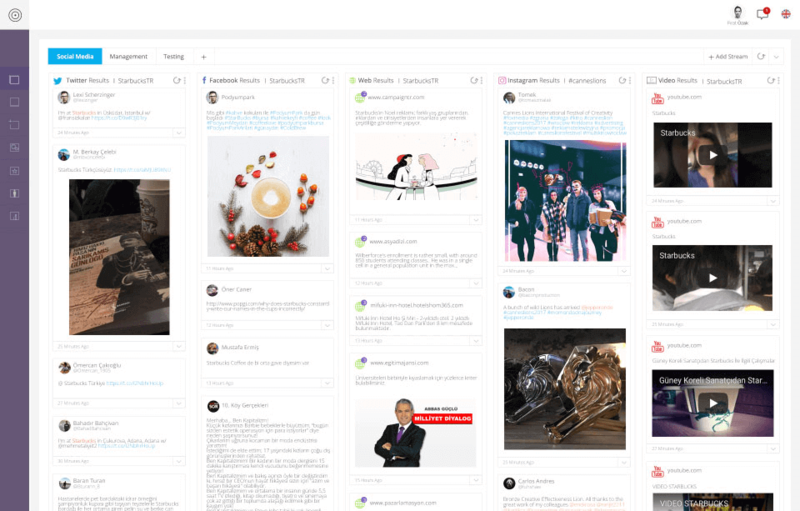 Find the news articles, posts, comments, videos and images posted on millions of news sites, portals, forums, blogs, review sites and all major social networks. 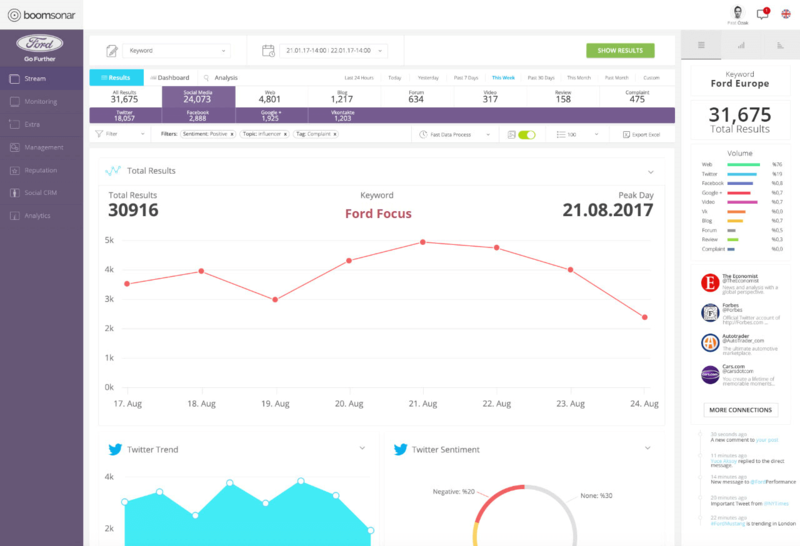 Find the sentiment of your results, assign topics and tags, take notes, add users to your lists, find influencers, reach early adopters, increase customer satisfaction. Analyzing data is easy with the processing options and advanced data tools of BoomSonar Suite. 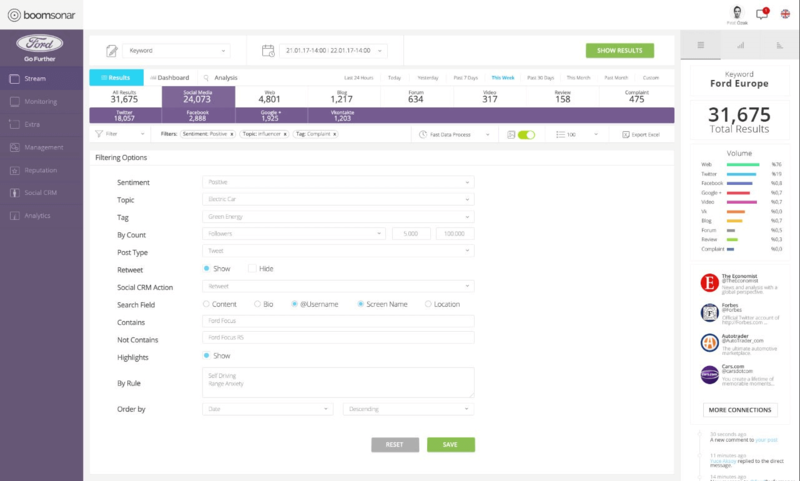 Powerful query options, multilevel filtering, deep drill down options, in-depth result search and single click data processing. Analyze thousands of results with easy to use filters and tools. With over 1.500 categories to explore, the deep segmentation is unique to BoomSonar Suite among all monitoring tools. BoomSonar Suite allows filtering of both web and social media data, and to process all results with a single click. The fast data processing options are extremely useful for even the largest research projects. Never Get Lost in the Big Data! BoomSonar Smart Algorithm is a fully autonomous learning system. It provides instant classification, data processing, smart suggestions and business intelligence insights. 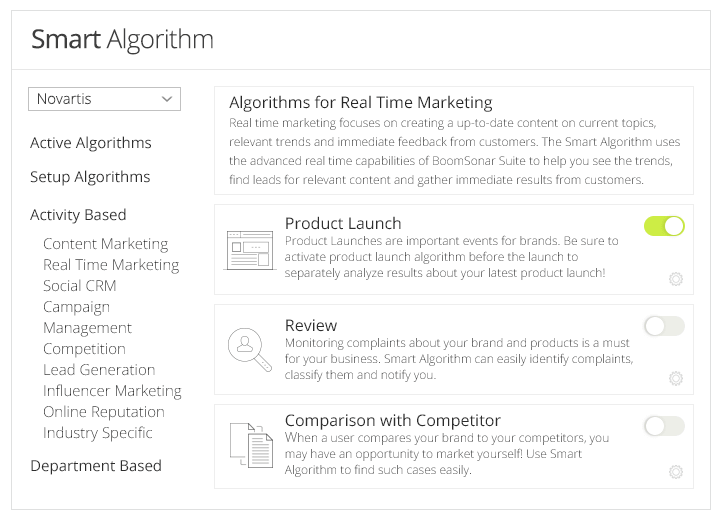 Smart Algorithm provides actionable insights, notifies you about the most important results, suggests the best courses of action for every result, takes action for you; and helps you make the best use of your monitoring results. BoomSonar’s unique Smart Algorithm has numerous functions for each department and activity of your company. Let The Algorithms Work For You! Machine learning using big data analysis, ready to use! User friendly and flexible dashboard of BoomSonar Suite helps you to analyze your results with ease in real-time. Keep an eye on your competitors with customizable charts and tables, visualize the results, and gather insights in a single dashboard. BoomSonar Suite allows filtering of both web and social media data, and processing of all results with a single click. The fast data processing options are extremely useful for even the largest research projects.